DeFender™ Flares are designed to match Poison Spyder's front DeFenders™. These weld-on DeFender™ Flares may be added to your existing Poison Spyder Crusher Corners or competitors' full corner armor. Fabricated entirely of 3/16" plate steel, DeFender™ Flares are a tubeless design, meaning they aren't constructed with the thinner wall (.120") tubing outer rail, as traditional tube fenders and flares are built. DeFender™ Flares feature a sturdy outer edge formed of 3/16" plate, with a full under-side return for strength. "Comp Cut" DeFender™ Flares are intended to be added to "Comp-Cut" style Poison Spyder Crusher Corners™ or other manufacturers or DIY comp-cut corners. They are open at the rear, to accomodate the open rear styling of comp-cut corners and provide for stretched wheelbases and un-restricted tire access to obstacles at the rear corners of the Jeep. PLEASE NOTE that there are TWO different styles of Comp-Cut DeFender Flares, which we refer to as "093" and "094". The diagram at right shows the different dimensions of each style (you may click on the image for a closer look). Style 093 was designed for use with corners that were cut to be used in conjunction with "wheel well to wheel well" (or WW2WW) Rocker Knockers™ or other manufacturers' WW2WW rocker protectors. The forward, lower portion of the flare doesn't extend as low, so that it will stay completely on the shorter-cut WW2WW corner. 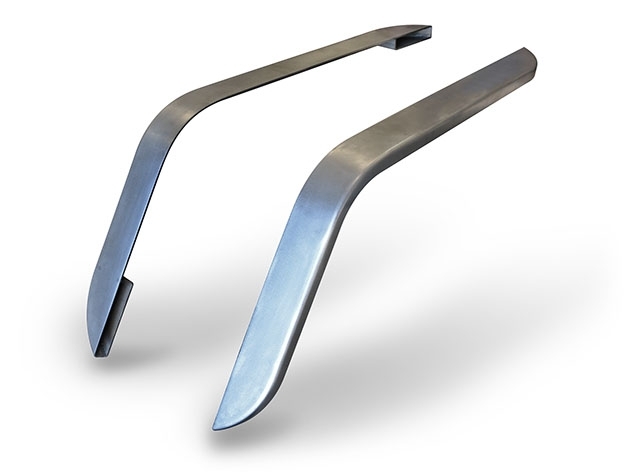 Style 094 was designed for use with Poison Spyder's standard Comp-Cut Crusher Corners™ or other manufacturer's comp-cut crusher corners that extend to the bottom of the rocker at the forward edge. In other words, for corners that were designed to fit with "flare to flare" Rocker Knockers or other manufacturers' flare-to-flare rocker protectors. On the 094's, the forward lower part of the flare extends downward for more complete coverage on those style corners. You are currently browsing the 094 style. Click Here to switch to the 093. I bought these to use on my comp corner that i got some place else . these fit great and only required minor fitment to weld on they do how ever come all the way down to the bottom of you rear wheel opening so if you are running rock slider they will cover part of them FYI But the look and the construction of these is very top notch.